Assignment for "User Interface Design and Development" course, Fall 2013. Functional prototype here. The InConcert project started with a deceptively simple idea: to design a platform that makes it easier for people to attend live music with their friends. Based on our research, we determined InConcert’s core functionality—invitation functionality, a ticket-buying service, and a marketplace—and developed them iteratively. The result is a work in progress, design that has come a long way but that needs further refinement of its core and further development at its periphery. 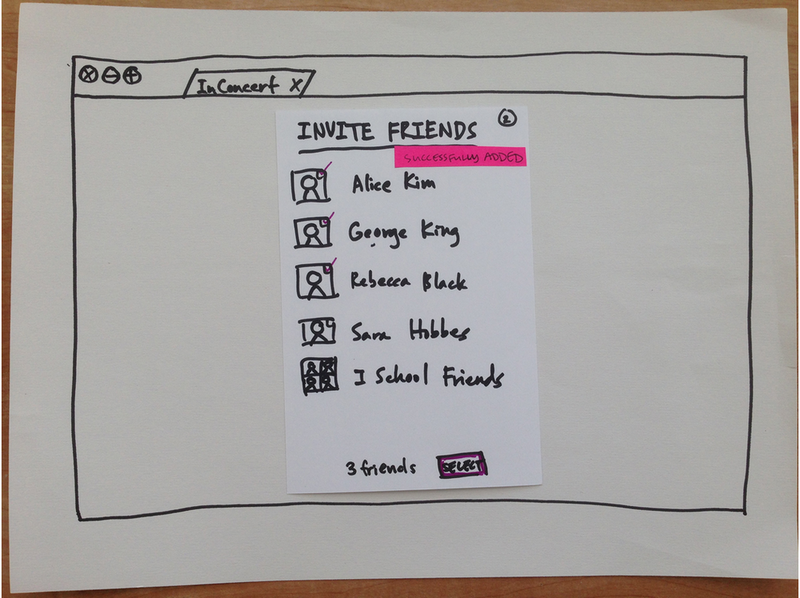 After our initial contextual inquiries, the first phase of the design process was to create lo-fi paper prototypes. As a team, we decided on the following four major tasks that our system would support: finding a show, organizing a group to go to a show, responding to a show invitation, and buying a ticket to a sold out show/selling an extra ticket. We aimed for consistency in our layout from page to page: a grid where the event information is displayed horizontally, and information such as the date, band name, and friends’ attendance status are aligned vertically. However, we made minor adjustments between pages to emphasize certain information components depending on the primary purpose of the page. For instance, the date is emphasized both with size, color, and by being on the left on the MyConcerts page, since the most important feature on that page is knowing which shows you’re attending when. I designed the grid pattern that we used as a temple on various pages of the site, and focused on the “MyConcerts” page. Our final prototype is at http://bit.ly/1gxg8D9. Selected screenshots are below.